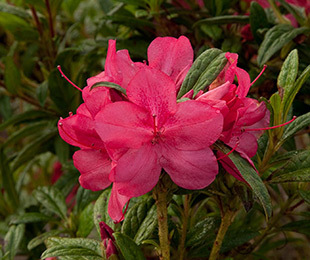 Description: An Azalea with a dense, spreading habit and shiny green foliage that turns deep purple in winter. Heavy flowering in autumn and spring, with regular flowering in summer. It has single vibrant pink flowers 50mm in diameter and holding on the plant well. Attracts butterflies.